Much to the inspiration of my dear friend and fellow wrestling fan(and Batman 1966 fanatic!) Josh of JW's Wrestling Memorabilia, I've decided to do a blog entry(and maybe more!) showcasing the interesting, the memorable, the "wow, why did they make that!" in HORROR MEMORABILIA! So with that, I begin my journey. I suppose everyone has their favorite piece of memorabilia. Be it a worn out vhs copy of The Horror of Frankenstein, an autographed photo of Vincent Price, a Pinhead action figure, or even a Freddy Krueger Snowglobe! I've seen collections that showcase a specific movie, trend, character, or just anything that a fan could get their hands on. Personally, my collecting habits are a little(or maybe vastly depending on your definition of "fan") different. I've always focused on collecting VHS and DVDs. Just as recent as 2001, I began collecting autographs from horror stars and icons. But, in between being a young lad watching Creepshow and being a loud and obnoxious adult who watches movies like "The Carpenter", I've amassed a small collection of neat knick knacks that make my room go from "smelly basement" to "creep, smelly basement with slashers everywhere!". A Freddy Krueger YOYO?!?! Yep, in the late 80s as Freddy and the Elm Street saga was slashing it's way to the top, we began to see silly merchandise opportunities for the Springwood Slasher. Freddy was everywhere. His glove was a very popular Halloween accessory. He appeared as action figures, in comic books, squeeze balls, sticker albums, pajamas, even a CAR SUN SHADE! These are just tiny examples. I could go on and on. The point is, when it comes to horror, most people don't want the movie to end after the credits! They want to live it by any means necessary! And this is where the merchandising really comes in handy. Are you on a long trip and that radio is making your ears bleed? 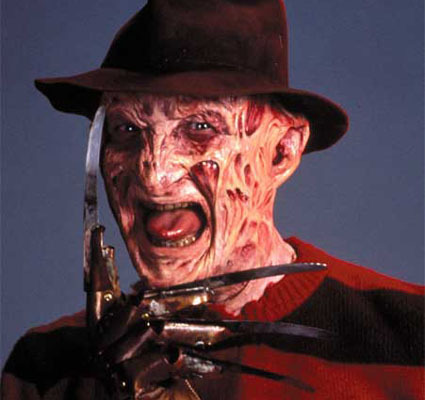 Sit back and enjoy "Freddy's Greatest Hits" by Freddy and the Elm Street Group. Yep, Robert Englund himself stepped into the studio to lay down some tracks with an allstar band called "the Elm Street Group" in this release. And of course the answer the yes...I DO have this entire record on my iPod. What can I say, it comes in handy when traveling to horror conventions! Even a board game! Wow! What better way to spend Friday night with the family than celebrate your favorite killer? Don't forget the popcorn! That is until a bunch of parents had a problem with it. I mean a HUGE problem. A lot of parents objected to walking down the toy aisle and hearing a doll scream "Welcome to Elm Street" and a handful of other phrases. This WAS 1989 though. At that point the worst we had seen was Skeletor. So, after a hearing enough Matchbox took the toy out of the stores and pretty much stuck with toy cars. But that wasn't Freddy's last hoorah in the toy aisle. 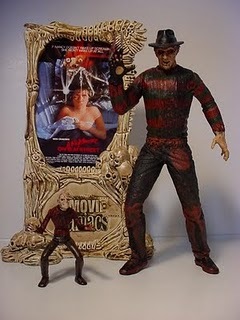 In 1998 Todd McFarlane and his company "McFarlane Toys" released a new toy line called "Movie Maniacs" with consisted of Freddy, Jason, Leatherface and would eventually have many other horror luminaries including Edward ScissorHands, Predator, Ash from Evil Dead, The Terminator and many many others. These figures were extremely detailed down to a T. Everything was represented perfectly; his glove, the sweater, the hat, even that sinister snear that Freddy get's when he decides to gut his victim. These figures were and still are, highly collectible and very sought after due to their fantastic craftmanship. A variant in the line showed the characters with blood stains all over their bodies to simulate the villains at what they do best, and we all know what that means! Many other companies have put their finger in the Freddy pie. 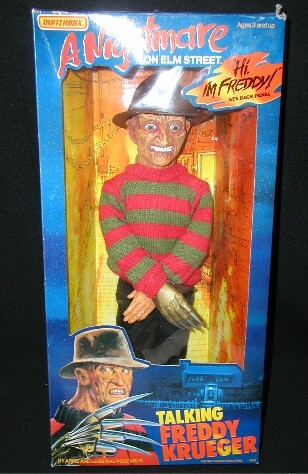 Releasing many Freddy-related merchandise from lunchboxes, toys, posters, t-shirts, wallets, even a Halloween candy dish! The merchandising has become a little bit more refined these days. Now you can walk into Spencers and find Freddy dolls and bracelets and shirts. Heck, FYE still has many Freddy merch as well! It's all fantastic too. It puts horror out there for the masses to enjoy. 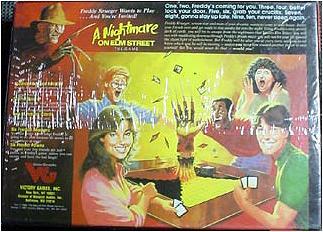 Besides who wouldn't want a 3-D Poster replica of the original Elm Street theatrical poster! Next entry: I return to discuss horror anthology films! Thanks for reading! in my daughter's school Halloween costume parade last year I saw 2 or 3 kids dressed up as Freddy. Anthology Films! More "Boo!" For Your Buck?